A limited edition picture of Dun & Dusted in full flight going for the line on a white ceramic mug. The mug is dish washer safe. 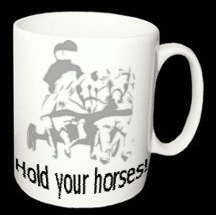 Delivery is only available to mainland UK at £1.50 postage & packaging per mug.